In many ways fitting a safe either for protection against theft or fire is a easily achievable DIY project. 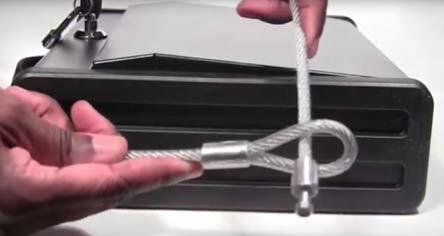 We show you the different ways to install a safe and explain the benefits of each method. We also explain why it is a good idea to have a security or fireproof safe in the home or for your business. We cover the different ratings that determine the levels of security a safe will provide so you can choose the right one for your needs – and for your insurance company, so they can reduce your premiums! Many people believe that safes are simply a protection against burglary and, living in secure areas, do not think to install one. Small fireproof safe – you can get this one at Amazon! Installing or fitting a security or fireproof safe in the home or office can give you (and your insurance company) much peace of mind not to mention reduced premiums. In the event of a fire in the home, having all your valuables secure, in one place and fireproof, is probably the only positive thing to come out of such a disaster. So many people are running small businesses today. Working from home these days is a common thing and the paperwork generated in any business is considerable. Cash is required for many payments without accounts and cheque books, credit cards, passports and driving licenses are (in the days of credit fraud) very valuable documents indeed. These two reasons for having a safe; protecting cash, valuables and important documents against either fire or theft (or both) drive the categorisation of the range of safes you might buy. Understanding how the safe making and insurance industries categorises safes is very useful when you come to buying one for your own use. What are the Different Types of Safe and their Categories or Ratings? These are not mutually exclusive, so some safes will offer protection in both categories, although it is hard to do both effectively. Security safes have thick solid walls that conduct heat well but stop a thief, where as a fireproof safe typically has a thinner insulated wall that is less robust in the face of a physical attack. Beneath these high level categories there are finer rating systems to make the plethora of choices that are available easier to choose from. This is particularly important for the insurance companies so that they can understand the level of protection a particularly safe offers. This means that they can offer the appropriate premium or reduction in the premium for valuables kept is a higher rated safe. There is a standardised rating for safes to determine their level of protection against theft, often called the “insurance rating”. 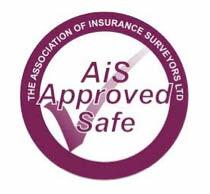 It is very important, particularly if you are getting your safe for insurance purposes, to ensure that rating is approved by the AiS (Association of Insurance Surveyors) which is the UK’s top authority on insurance ratings backed by the major insurance companies. Even so do check with your insurance company that your chosen safe meets their requirements. * For Eurograde 4 and above, two locks are required, with separate keys so the keys can be issued to separate people and when the safe is opened these two people will need to be present, adding an extra level of security. This is likely to be for commercial use. It is very important that the safe is installed correctly as if not this will be a weak point which could be exploited by thieves and also allow the insurance company to decline compensation should a thief be successful. See below for more information about how to install your safe correctly. If it weighs less than 1000kg if must be bolted down in (unless it is a designed to be a free standing safe). The ratings range from 30 minutes to 240 minutes (4 hours). Before you start, if you are installing a safe for insurance purposes it is worth checking that your insurance company will approve your installation. It is vital that you follow the manufacturer’s instructions specific to the safe you are fitting and use the recommended fixings as failure to do so might invalidate a claim if the worst were to happen. If you need to you can find a locksmith to fit your safe here. Now that the ‘disclaimer’ is out of the way we can get down to the business of installing your safe! On the whole, this is a relatively easy DIY job. This is the equipment that will be needed to install a safe. 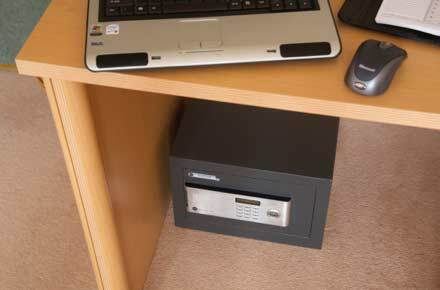 Pick a good place for your safe; somewhere accessible but not too obvious and easy for a burglar to find. Pick a corner if you can as this give your burglar less sides to try and get in and leaver it up. 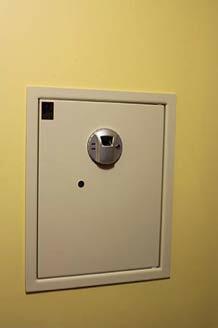 There are a number of different ways that you can install a safe depending on where it is going to be. Once we have described all these installation methods we will give have a table with the pros and cons of each. See below for more details. Fitting the safe could not be easier. Each safe comes with pre-drilled holes in the back and/or base. 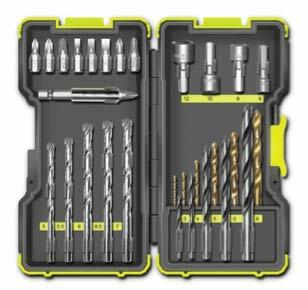 Use our fixing to masonry project to drill the required holes and ensure a secure fit. Position the safe (make sure you can get to it and open the door), mark the holes and then remove the save to drill the holes for the fixing bolts, before returning the safe and bolting it down. Use the recommended fixing bolts of screws and follow any specific instructions. You should be able to do this yourself unless the safe is very heavy then you might need help getting it into position. Fixing to a wooden floor follows the same principle as fixing to a concrete floor, but it will not be as secure. Don’t use a safe over 60 Kg on a wooden floor. The difference is that you will need to use coach or carriage bolts, ideally fixed through a joist and then tighten the nut inside the safe. It is a good idea to use a strong grab adhesive, like Stixhall or No More Nails. Do not use glue if you are renting and might need to remove the safe at a later date, as this will make it impossible without causing significant damage. Never fix to a floor with underfloor heating and watch out for pipes or cables that might be lurking under your floor or in the walls! On some occasions you will need to fix a base to the floor and wall and then the safe attached to it, either permanently in the case of a PAD4 base safe or occasionally for a lock to base safe. 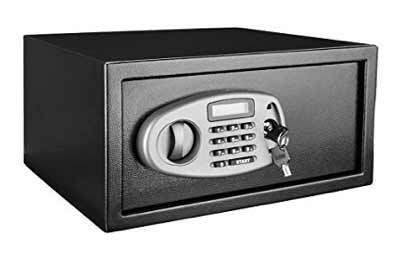 Adding a base to your safe, if it is designed to be fixed to one, typically makes the installation even more secure and can improve the insurance rating. A lock to base safe is used if the safe might need to be transported. You will find these in vehicles and their destinations. A PAD4 base is used for fix the safe with a chemical anchor (strong glue) so that no holes need to be drilled into the safe. This ensures that the fireproofing capacity of the safe is improved, as well as the insurance rating too. Fixing the base is done in exactly the same way as you would fix a bolt down safe, as described above. Once the base is fixed you then attach the safe to the base as instructed. If using a chemical anchor this will typically be provided with instructions which you should follow. Rather than fixing the safe to the wall it is possible to put the safe into the wall which makes it even more secure, protected and easier to conceal. For a stud wall, you need to use a stud finder, which can find out how to use here. You need to find a section of the wall that is suitable to fit your desired safe, and does not have any studs, pipes of cables running through it. 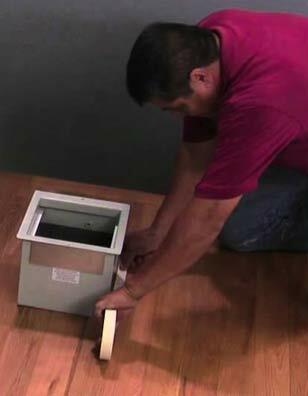 Mark out where the safe will go and then you can cut out that section of your wall using a drywall or jab saw. You can see how to do this in our project on cutting plasterboard. Brace the hole with studs and noggins to support the safe that will go into the hole you have created. 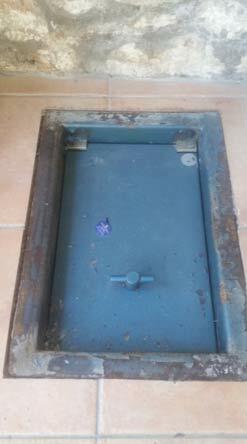 Ensure that there is something to fix the safe to once inserted into position. It is useful to have someone to assist as the door, which is often the heaviest part will be open and make it awkward to manoeuvre and over balance the safe while you’re trying to hold it in position. To fix your safe into a brick or masonry wall you will need to remove the appropriate amount of bricks – the safe should be sized to the standard size of a brick, so you can remove 2 or 3 say and it should fit. Ensure that it is structurally safe to remove the bricks or masonry from the wall before you start. We show you how to remove a brick in our removing a brick project and the process is much the same but on a larger scale to make the whole the required size for your safe. To make the job easier you might consider using a disc cutter, although this is a serious piece of equipment so not for the feint hearted. Prepare the hole; you might need to fill gaps with mortar, which you can see how to mix here. 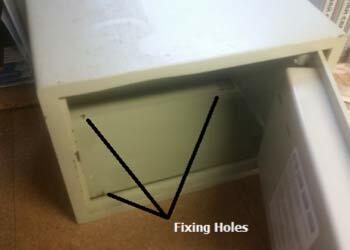 Once the hole has been prepared you can slide in the safe (possibly with help if it is heavy) and then fix it with bolts as describe above when fixing a safe to a wall or floor. There is likely to be a rim on the safe that will cover up the edges of the hole when the safe has been slid in, rather like an architrave around a door frame. For both options you need to consider the position of the safe carefully; it needs to be discrete and but you need to be able to access it. It will probably need to be covered somehow by a rug or furniture. Mark the size of the hole, which should typically be 100mm (4 inches) wider than the size of the safe. 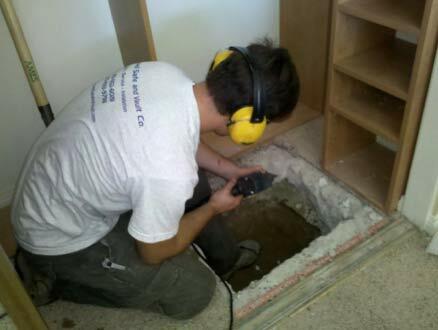 Dig down using a breaker or demolition hammer to approximately 75mm (3 inches) deeper than the height of the safe. Line the hole with damp membrane to stop water or moisture getting to the safe and seal the damp proofing membrane. 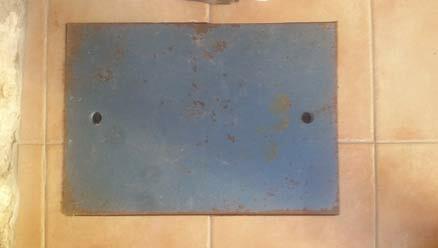 Pour a base layer of concrete into the hole to provide a firm, flat base for the safe. Ensure that the height is correct so that the safe it not sunken into the hole, or probably worse, sticks up out of the hole when in position. When this is has gone off you can lower your safe into position. 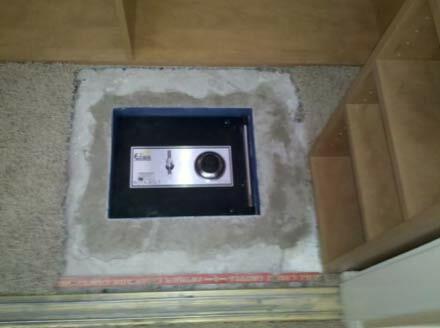 Once the safe is positioned correctly and at the right height, you can then pour the concrete in around the safe ensuring that there are no gaps. Smooth off at the top and wait for it to set. Finish the floor as required to match the surrounding area and making it level so it can be hidden under a rug. Fitting a safe, a fireproof safe or fireproof document store should be part of an insurance approved security package for your home which might include CCTV and an upgrade in security locks. Keeping home insurance premiums to a minimum is one of the many things DIY Doctor can help you with. 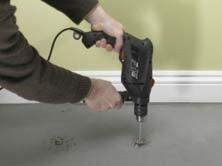 This process is essentially the same as installing a safe into a solid, concrete floor, except the concrete is not there. This has the benefit of you not having to dig out lots of concrete, but then you have to build the shuttering to hold the concrete which will be poured in around the safe, as you do for an under floor safe in a solid floor. Firstly, mark out the position where you intend for the safe to go. It is more likely that there could be pipes and cables under a wooden floor than for a solid wall so watch out for these. 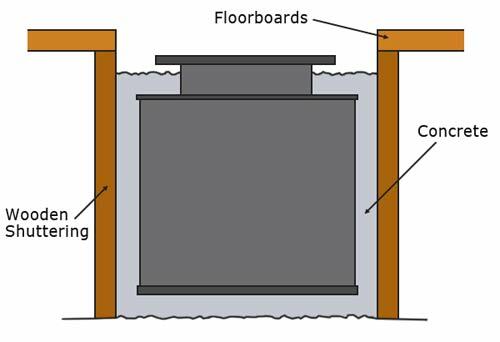 You will be cutting a hole through the floor boards which should be, as for the solid floor, about 4 inches (100 mm) wider than the safe so as to get the concrete in around it when it’s in position. Drill a hole through the boards to start you off giving you a place to get the saw in. Make sure that the position of your cut will not weaken the floor, and brace and strength it where necessary. You might need to dig into the earth under the floor to get to the right depth for your safe. 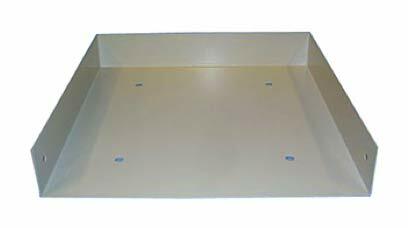 You need to go/dig down approximately 3 inches (75 mm) below the level of the safe to make a sound and flat base for the safe, as described in the solid floor section above. Build your shuttering to hold the concrete. This is effectively a wooden box which the concrete surrounding the safe will be poured into. Line this with a damp membrane as for a solid floor and then pour the base. Once set you can position the safe and then pour the rest of the concrete. Whatever anyone says, installing a safe is a job that you can do yourself. The only proviso is that you check with your insurance company before going ahead as it might affect your premium. A bolt down safe is a very easy installation, but as you get more intrusive by fixing your safe in the wall or floor it becomes a bigger project, but by no means an impossible one.